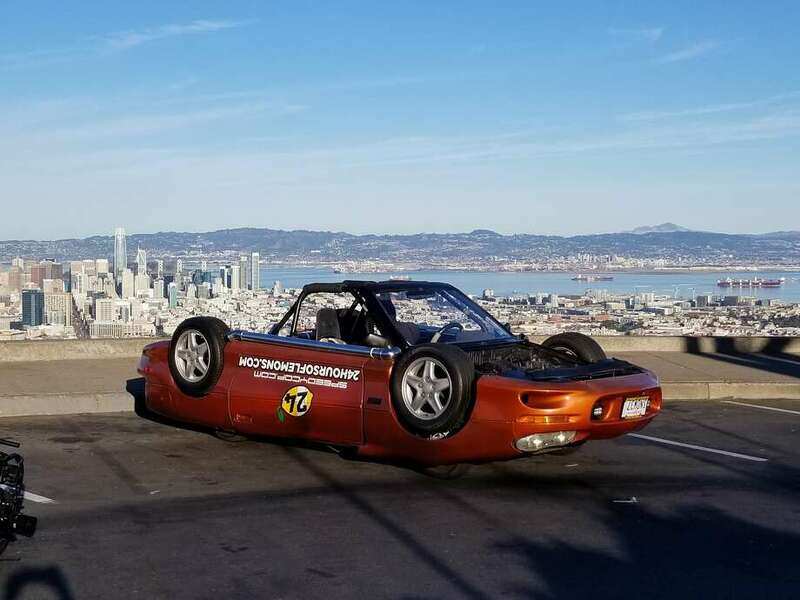 "The sight of a celebrity driving on the hills of San Francisco Sunday afternoon was upstaged only by the spectacle of what was being driven: namely, an orangeish, upside-down 1999 Camaro." "Jay Leno was in town this weekend shooting an episode of his TV show "Jay Leno's Garage" and taking a tour of the city in the odd-looking Camaro. Riding around with him was Jeff Bloch, a police sergeant in Washington D.C. who built the car." "Bloch, who goes by the moniker Speedycop, built the car in 2013 over the course of three weeks to take part in a 24 Hours of Lemons race, where cars that cost $500 or less are pitted against each other in a misfit race that thumbs its nose at at the overpowered, high-priced ways of other motor races." Maybe it is the Class A cars that are subsidizing the race with their numbers, but it is the awesome Class C cars that bring in the publicity, and feed new teams and drivers into our series!!! Maybe it is the Class A cars that are subsidizing the race with their numbers, but it is the awesome Class C cars that bring in the publicity, and feed new teams and drivers into our series!!!. Just imagine if Jay Leno were to enter a Lemons car! I greatly respect the man because, in one of his videos, he said that :"Super Snipe" is the funniest name ever given to a car. stumbled onto this live. It is normally 35 MPH winds and 38 degrees up there. Saturday is was shirtsleeve weather. He also owns a two-stroke SAAB, so clearly he's a man of impeccable automotive taste and refinement. Checking the news. . . , fires near Santa Barbara will burn another week, check, UFOs researched by Pentagon, check, "Texas restaurant owner apologizes after Ted Cruz, Trump Jr. visit", "Marin man injured in fall from mule in Hawaii" . . where's the ordinary news gone? And then the headline reports 'Jay Leno spotted in SF driving an upside-down Camaro' - finally, something normal and sane for a change! And then the headline reports 'Jay Leno in upside down Camaro' - finally, something normal and sane for a change! My wife and I were driving down Hollywood Way in Burbank. She pointed at a car ahead of us and said, "That car sure is smoking a lot!" As we got closer we saw that it was just Jay in his Stanley Steamer. Nothing out of the ordinary here. Has Jay's head grown larger recently? He is actually a HUGE man (not just his chin) and Jeff is not...the juxtaposition is very telling.